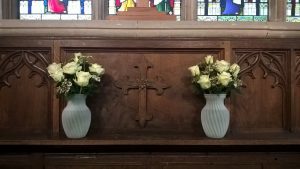 There are two ways in which flowers and displays are put in Church. The weekly rota is now available at the back of the Church. You will notice that this is done in two weeks sessions, please don’t let that put you off, it is not a central heated home so many flowers will keep for this length of time. Perhaps you have an Anniversary or birthday of a loved one when you would like to place flowers at the altar. Please put your name on the rota and I will make sure that you have all the details that you need. If you would like flowers to be put in church but are not able to do so and would prefer to give a donation, please contact me. For festivals and special events each person has either a window or an area to put their arrangement. The Church festivals include, Easter, Harvest, Christmas and during the year the Church may be decorated for services such as a special Songs of Praise, Royal occasion etc.